Jubilant scenes are unfolding on the streets of Zimbabwe's capital Harare, as protests demanding the resignation of President Robert Mugabe have turned to a celebration of the army's role in ending his grip on power. BBC correspondents say protesters are hugging soldiers in the crowd and cheering for them. One man told the BBC the day was "about a new beginning". 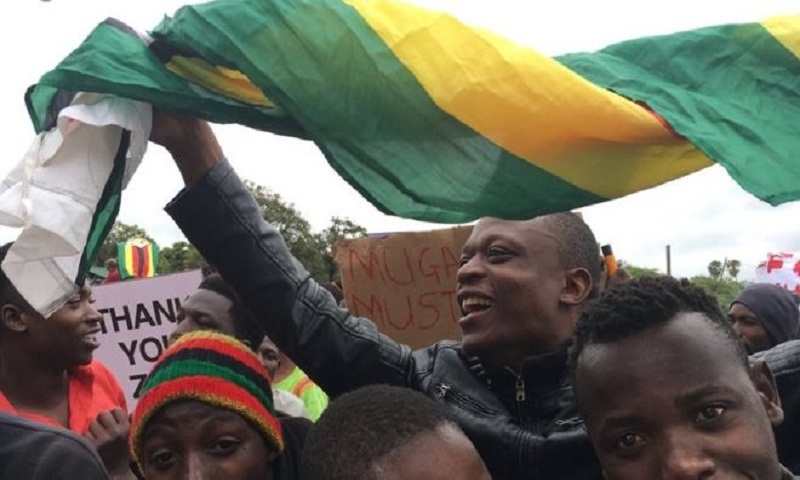 The rally is supported by the army and members of the ruling Zanu-PF party. War veterans - who until last year were loyal to the president - are also saying Mr Mugabe should quit. A BBC correspondent in Harare says this is a watershed moment and there can be no return to power for Mr Mugabe. A man arriving at the rally said: "As Zimbabweans, we are saying to our army: Thank you very much for the peaceful intervention. "And it's time for the masses of Zimbabwe to say: Mugabe must go and must go, like, yesterday. We can't wait to see his back. For us, it's about a new beginning. Mr Mugabe, 93, had been under house arrest since the army takeover on Wednesday, but on Friday he made his first public appearance. He spoke only to open the graduation at a university of which he is chancellor. The military made its move after a power struggle over the successor for Mr Mugabe, who has held power for 37 years. He sacked Vice-President Emmerson Mnangagwa last week, apparently to pave the way for his wife Grace Mugabe, who is four decades younger than him, to take over the presidency instead. The military said it was "engaging" with Mr Mugabe and would advise the public on the outcome of talks "as soon as possible". Mr Mugabe has led Zimbabwe since it gained independence from Britain in 1980.
Who is protesting in Harare? Christopher Mutsvangwa - the leader of the influential war veterans' association - earlier this week called for a huge turnout at the rally. "We want to restore our pride and tomorrow is the day... we can finish the job which the army started." "There's no going back about Mugabe. He must leave," he said. Meanwhile, at least eight out of 10 regional branches of the Zanu-PF party voted on Friday for Mr Mugabe to resign as president and party secretary. In an unprecedented broadcast, several regional leaders appeared on state TV saying that he should step down. They also called for Grace Mugabe to resign from the party, and for Mr Mnangagwa to be reinstated in the party's central committee. The party's members agreed to mobilise support for and attend Saturday's rally. The party is planning to hold a special central committee session over the weekend to discuss the crisis.